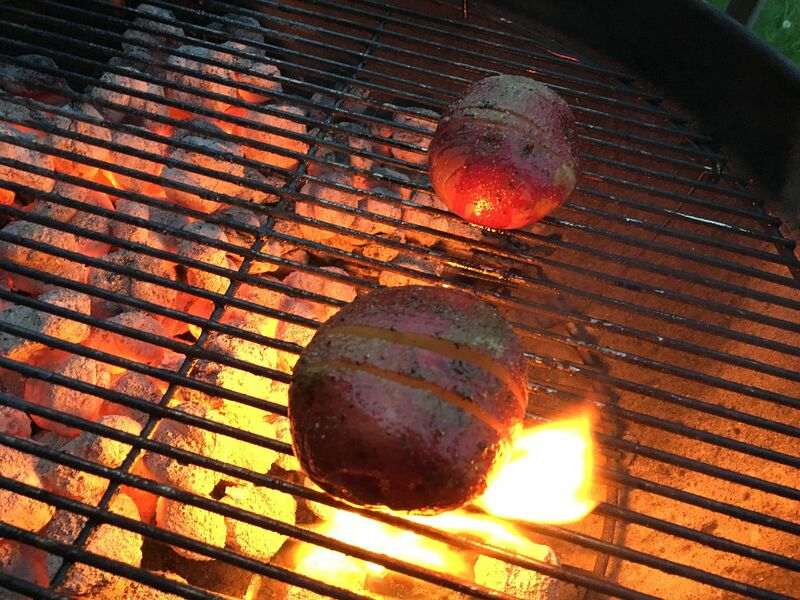 I have always been horrible with potatoes on the grill. I have made many a foil wrapped package of sliced tater that came out one of three ways: too mushy, burnt, raw. A few weeks ago, I had a request for a grilled spud that was not baked. I wracking my brain for the next potentially disastrous foiled potato episode. Then, I remembered Hasselback potatoes. It has been many years since I have made these treats. 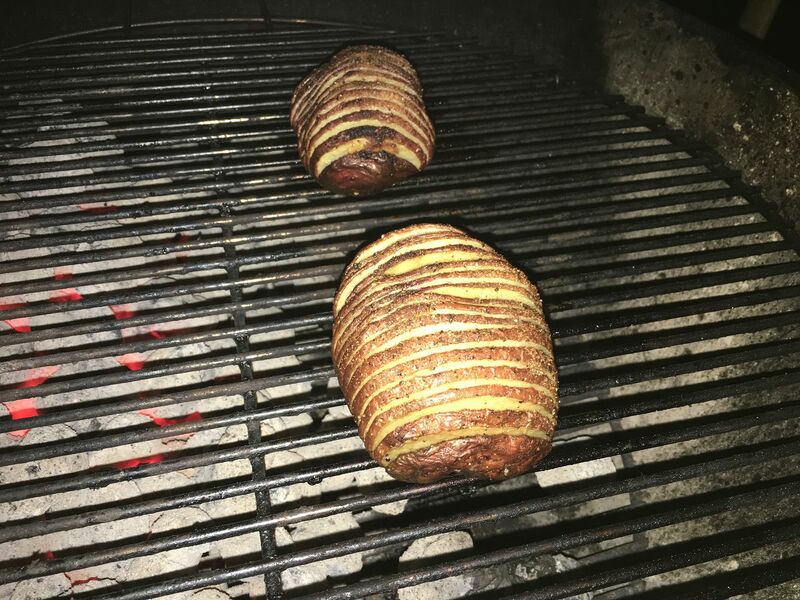 The Hasselback potato is kinda baked, yet nice and crispy. 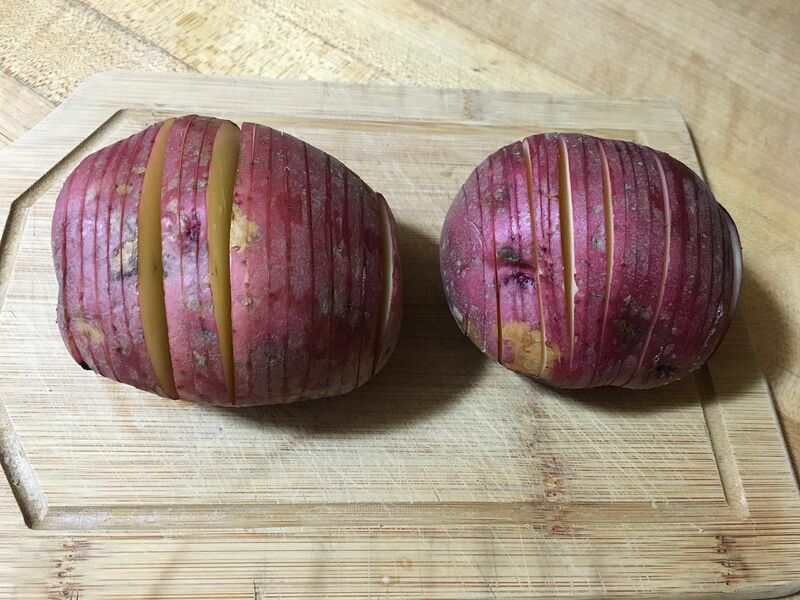 So, I dug through the spud bin and pulled out two of the biggest red potatoes I could find and went to work. After washing and drying the potatoes, I grabbed a knife and sharpened the blade for fine knife work. I laid the potato on its side and started making slices about 3/4 of the way through the potato. Each subsequent slice was as close to the last slice as I could make it and still make a slice. We will say 1/8th inch slices overall. The idea is to be able to fan the potato so that it can expand during the cooking process. 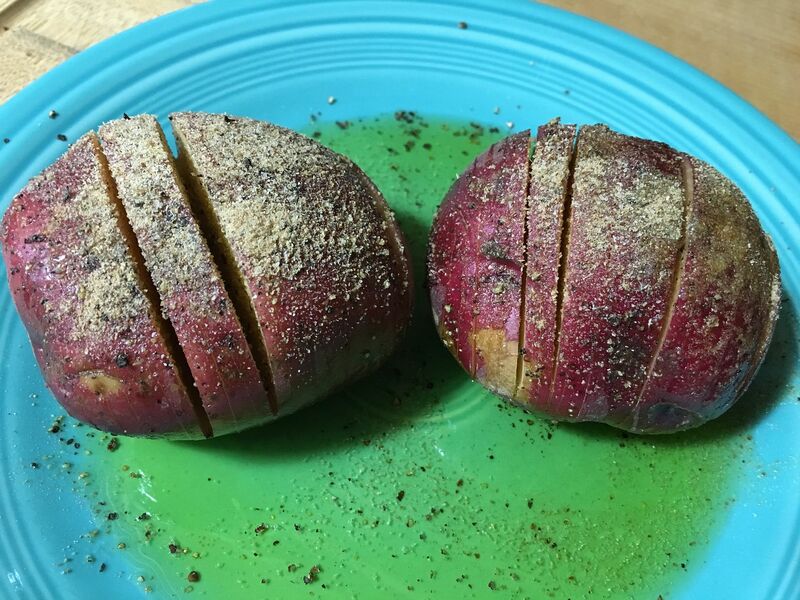 Here is what the potatoes looked like after slicing. Next, I drizzled the potatoes with olive oil, making sure to coat the surface of the potato thoroughly and to also get as much of the oil between the slices as possible. Then I seasoned them. You can choose your seasonings to pair with your main course. These spuds were sides for some nice steaks, so I added granulated garlic, onion powder, a bit of thyme, salt, and pepper. You could also put some grated cheese on top if you like. I have since I made these potatoes and it makes for a nice crispy cheese coating. I placed the potatoes on indirect heat on my grill, put the lid on the grill, and walked away for 20 minutes. After the first 20 minutes, I turned the potatoes 180 degrees and put the lid back on the grill and walked away for another 20 minutes. Halfway through the cook, these potatoes were starting to look nice and brown. After 40 minutes of total cook time, I placed the potatoes as far away from the fire as possible to keep them warm and grilled my steaks. These potatoes were pretty good. They were perfectly cooked the whole way through. They also had that nice crispy coating on the outside. 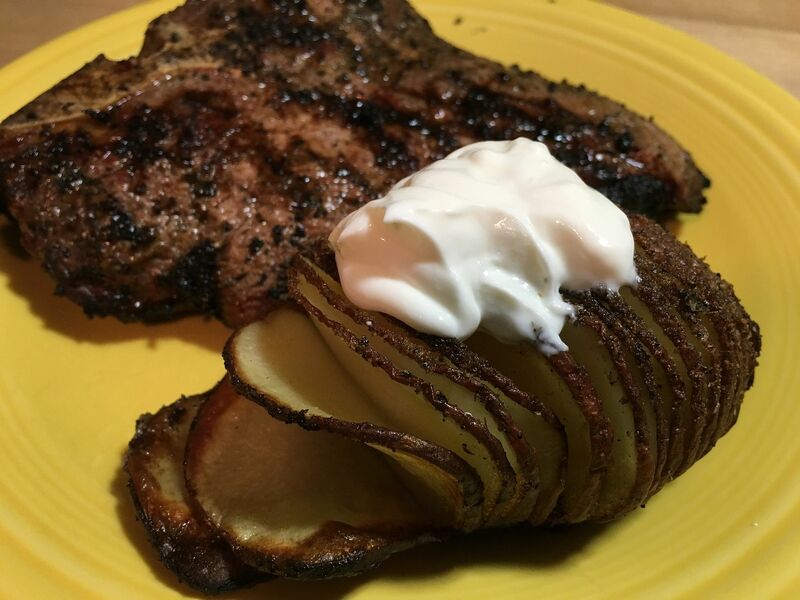 I placed a dollop of sour cream on top of my potato. I think I am done with foiled potatoes. Nice spin on the Hassleback potato. Thank you sir. I am glad they turned out as I really am bad at the foiled kind.